Stop putting off your journey to a HEALTHIER YOU! How many times have we said it? It’s Thursday Night – we want potato chips, and we put off our journey to a healthier us because we would much rather have gratification and tickled taste buds NOW. What if there was a way to overcome the procrastinating urge to put our health off to the side? Justin Willoughby has been featured on the Huffington Post, and NBC’s The Today Show, as well as numerous other outlets, and is going to tell you how he lost 600 pounds. One of his secrets? Overcoming the Monday Mentality! Justin Willoughby talks about defeating the desire to "start on monday." Want to lose weight? Don't wait! 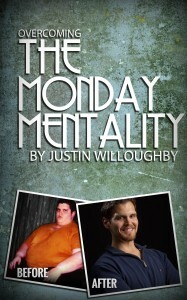 Justin tells about his success, and his failures in this captivating ebook, that offers you a glimpse into the power of Overcoming the Monday Mentality. Here’s what others have to say about Justin’s inspiration! I have been overweight my whole life, and have struggled with eating disorders. Through Justin’s story, I realized what my real problem was. He inspired me, because if he can lose so much weight in a healthy and proper manner, than I can do it also!